In the mood for Chinese--but, not really up for takeout? Or maybe you just want to have a little more control over your ingredients and the dreaded fat and sodium!! 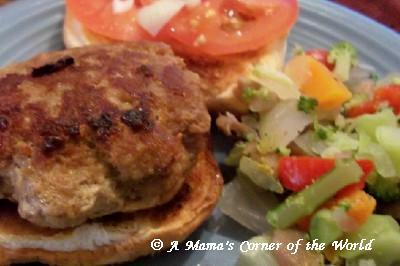 After trying a number of Asian turkey burger recipes, I developed this one from my own stir fry style ingredients! Many times my husband has said that he would just eat the seasoned meat without the full stir fry--so, here it is! Spray a nonstick skillet with the olive oil cooking spray, add the 2 teaspoons of dark Sesame Oil and heat oil until hot but not smoking. In a bowl, combine the other ingredients and mix just until combined. Divide the meat mixture and shape into four patties. Cook in heated, oiled pan until turkey is no longer pink. Serve on toasted bun or without bread, topped as desired. Mama's Cooking Notes and Substitutions. Resist the urge to flatten the meat! It will retain much more of it's juice and flavor if you allow it to remain "plump" and "puffy"! Don't have sesame oil or olive oil spray? Sesame oil really does add to the flavor--and it just smells wonderful! It is very high in sodium--and the price is a little ouch-y as well! Frying them in a nonstick skillet with plain cooking spray is fine too--or with a swirl around the pan of canola oil or olive oil! -Brown Rice (or white if you prefer!) We use whole grains whenever possible, and, while I use instant white rice, the instant versions of brown or wild rice are just not as tasty--and keep to much of their grainy texture. Try a long cooking brown rice(yep--the 45 minute kind! )before you write it off! -Steamed chinese style mixed vegetables. Frozen store brand California Blends work well because they have little to no added sodium! If sodium stalking is not your obsession, Green Giant has a delicious boxed, frozen vegetable blend in their Healthy Weight selections that is our favorite version to accompany the Asian Turkey Burgers. It contains sliced Carrots, sugar snap peas, black beans and edamame. Even most sodium trackers can fit this in as it has only 240 mg. of sodium per serving--and if you track Weight Watchers Points, a serving will only cost you 1 point!